TWO MEN on horseback said good-byes. "I should not be surprised if I never see you again," said the first. "Well," answered the second, "if I fall and you never see me again, tell my friends that I fell at my post trying to do my duty." Peter Cartwright. His colorful Autobiography remains a favorite source on frontier conditions. Illinois was flooded. Not a path could be seen beneath the sheet of water. Treetops, which might guide a bold traveler, stood miles away but would be out of sight whenever he rode into a hollow. He could easily lose his way or flounder into a hole. Even if he reached the trees, a swollen creek beside them would compel him to swim twenty yards. He might have to spend the night on the sopping prairie. The rider paused. On one hand was his duty to the souls of his frontier parish; on the other, serious danger. At that moment he recalled his motto: "Never retreat till you know you can advance no further." He rode forward. That decision was characteristic of Peter Cartwright, one of the most colorful frontier preachers in the young United States. Born in Virginia in 1785, just two years after treaty ended the American Revolution, he was taken West to Kentucky. There he became a tough guy in rough Logan County known as "Rogue's Harbor" because of its swarms of badmen. His Methodist mother pleaded and prayed with him. Her prayers wakened a response. In a camp meeting her sixteen year old son was convicted of his sinfulness and need for a Savior. For hours he cried out to God for forgiveness until finally the peace of Christ flooded his soul. At once he joined the Methodist Episcopal Church. Within two years he was a traveling preacher, bringing the gospel to the backwoods of the new nation. His rough past and hardy constitution served him well, for he faced floods, thieves, hunger and disease. He met every challenge head on. Once Cartwright warned General Jackson (future President of the United States) that he would be damned to Hell just as quickly as any other man if he did not repent. A timid preacher apologized to Jackson for Cartwright's bluntness. The general retorted that Christ's ministers ought to love everybody and fear no mortal man, adding that he wished he had a few thousand officers like Peter Cartwright. Frequently rowdies disrupted Cartwright's meetings. When one thug promised to whip him, Cartwright invited the man to step into the woods with him and do it. The two started for the trees. Leaping over the fence at the edge of the campground, Cartwright landed painfully. He clutched his side. The bully shouted that the preacher was going for a dagger and took to his heels. Another time Cartwright charged a group of rowdies in the dark, yelling to imaginary forces, "Here! here! Officers and men, take them!" The troublemakers bolted in panic. Such events gave him a name. A story spread that he had fought legendary river boatman Mike Fink. Crowds flocked to hear him. Throughout Kentucky, Tennessee and Illinois, Cartwright preached to hosts of men and women, speaking three hours at a stretch, several times a week. The conviction in his booming voice could make women weep and strong men tremble. 10,000 came to Christ through his preaching in meetings that often ran day and night. Cartwright baptized thousands, adding them to the church. Several church buildings were erected at his instigation to house services for the new converts. To answer a desperate need for more preachers, he championed the creation of Methodist colleges. Having schooled himself, he saw the value of learning. Wherever he went he left behind religious books and tracts to convert and strengthened souls in his absence. The joy of soul-winning compensated him for all hardships. Hardships were plentiful. Several times Cartwright went two and three days without food. He once returned from his circuit with just 6¢ of borrowed money in his pocket. His father had to outfit him with new clothes, saddle and horse before he could ride again. Traveling preachers were paid a measly $30- 50 a year with no family allowance. Nonetheless Cartwright married and raised children. His family was not spared tragedy. Forced to camp in the open one night, they were startled awake when a tree snapped in two; Cartwright flung up his arms to deflect the falling log, but it crushed his youngest daughter to death. In 1823 Peter Cartwright sold his Kentucky farm. He was disturbed by the effects of slavery on consciences and feared his daughters would marry slave owners. Slavery, he felt, sapped independence of spirit. His family readily agreed to the change and his bishop appointed him to a circuit in Illinois. In Illinois he more than once braved floods. Once he had to chase his saddle bags which were swept downstream. 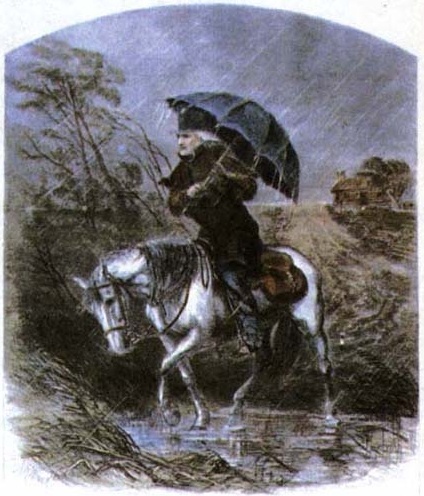 Another time, in snowy weather, when even he hesitated to enter a flooded river, his eldest daughter, riding with him, proved her own mettle, urging him onward. In every instance, the Lord brought him to safety. He died at eighty-seven, leaving behind an autobiography which became a classic as much for the exploits it recounted as for the picture it painted of frontier life. His courage won him numerous sons and daughters for Christ. He stayed at "his post to do his duty." In 1812 a severe earthquake struck New Madrid, Missouri. At places along the fault the Mississippi flowed backward. Thousands cried out for forgiveness of sins, believing the end of the world had come. Many later joined churches. Pioneers, isolated from church communities, often had little knowledge of spiritual terms. One preacher asked a woman if she had any religious convictions. "Naw," she replied, "nor my old man neither. He were tried for hog-stealin' once, but he weren't convicted." Because drunkenness was a problem on the frontier, Peter Cartwright thought he'd demonstrate the danger of strong drink. He placed a worm in a glass of wine. It wriggled. He transferred it to a glass of whiskey. It curled up and died. "There," Cartwright said. "What does that tell you?" A man replied, "It shows that if you drink whiskey you won't have worms." Francis Asbury, one of Cartwright's overseers, was the first Methodist bishop in the United States. He traveled nearly 300,000 miles in his life, building the Methodist church from 300 members to over 200,000. Historian Nathan Hatch asserts: "Between 1840 and 1860, the Methodists founded at least 35 institutions of higher education. Between the Civil War and 1900, they founded more than one college or university per year. . . . By 1852, eleven of thirteen congressmen from Indiana were Methodists. In 1880, no denomination could claim the affiliation of more governors than the Methodists." Running for Congress in 1846, Peter Cartwright lost to none other than Abraham Lincoln. In 1832, over a decade earlier, however, Cartwright had defeated Lincoln in a race for the Illinois legislature. ". . .in reference to the Methodist Episcopal Church, when we consider that her ministers were illiterate...that we were everywhere spoken against, caricatured and misrepresented; without colleges and seminaries, without religious books or periodicals, without missionary funds, and almost all other religious means; and our ministers did not for many years, on an average, receive over fifty dollars support annually, and a Methodist preacher's library almost entirely consisted of a Bible, Hymn Book, and a Discipline, may we not, without boasting, say with one of old, 'What hath God wrought?' A Methodist preacher in those days, when he felt that God had called him to preach, instead of hunting up a college or Biblical institute, hunted up a hardy pony of a horse and some traveling apparatus and. . .cried 'Behold the Lamb of God, that taketh away the sin of the world.' In this way he went through storms of wind, hail, snow, and rain; climbed hills and mountains, traversed valleys, plunged through swamps, swam swollen streams, lay out all night, wet, weary, and hungry, held his horse by the bridle all night, or tied him to a limb, slept with his saddle blanket for a bed, his saddle or saddle bags for his pillow, and his old big coat or blanket, if he had any, for a covering. Often he slept in dirty cabins, on earthen floors, before the fire. . .His text was always ready, 'Behold the Lamb of God.' "
What are your thoughts on this article? Click here to email us. Help Support Our Efforts to Educate the poor souls who follow False Teachings and False Prophets.